Sh2 -187 is a diffuse nebula visible in the constellation of Cassiopeia ( Astronomy Magazine Picture of the Day November 14,2013). Taken by Lynn Hilborn, WhistleStop Obs,Grafton,Ontario on September 05 and 08,2013. TEC 140 @f5.3 and ML8300 camera with Baader filters. LRGB image L bin 1x1 12 x 10m, RGB bin 2x2 12x 5m. This is an H II region located on the outermost edge of the Orion Arm , visually appears surrounded by dark nebula LDN 1317. The distance was estimated through studies spectrophotometric in about 1440 parsecs (4700 light years ) from the observation of stars exciters gas this and other surrounding clouds, its position coincides with that of the source 2MASS 01230704 + J 6151527. The cloud belongs to a large molecular complex at the center of which is located a molecular jet at high speed, originated from a source of infrared radiation cataloged as S 187 IRS, located very close to another strong source, IRAS 01202 +6133. The visible part of the cloud is surrounded by an extended envelope of neutral hydrogen , detectable at wavelengths other than visible, whose mass total can be estimated at about 7600 M ☉ . Its age can be estimated instead around to 100-200000 years. 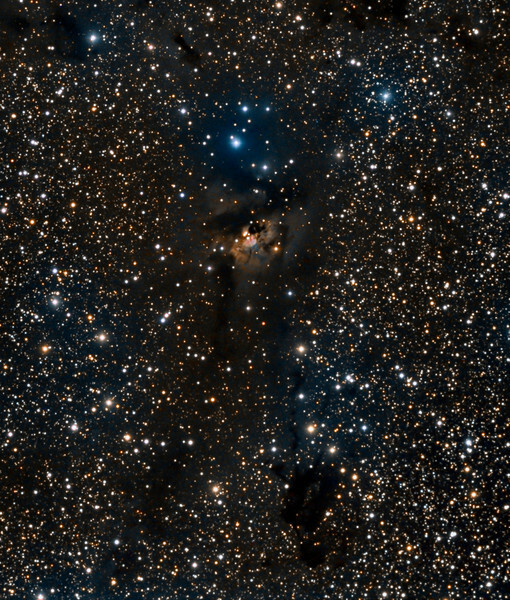 The evidence of the presence of phenomena of star formation may be identified in numerous infrared sources discoveries in the nebula, like those just mentioned including the molecular jet; in particular, one of the most powerful sources is IRAS 01 202 +6133, inserted deep into a dense cocoon easily identifiable bright infrared (S 187 IRS), whose counterpart in visible light is known as S187Hα: it would be a star Ae / Be Herbig .